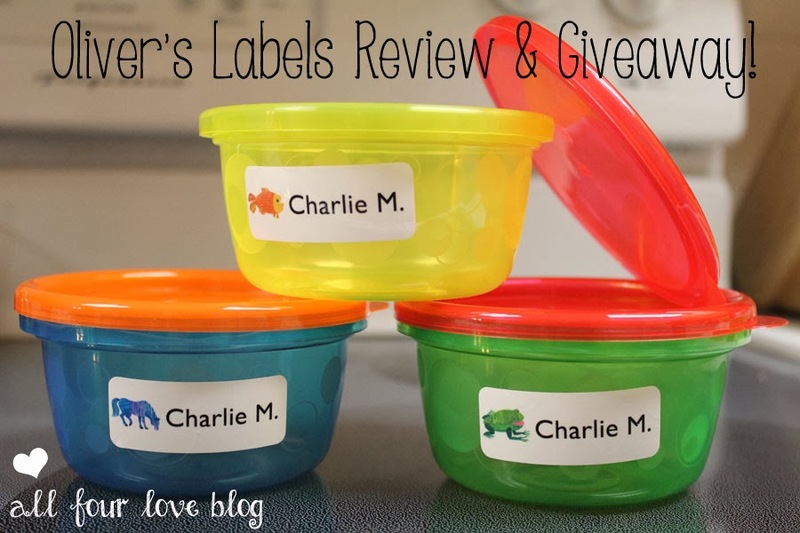 All Four Love: Daycare Transitions & Oliver's Labels Review and Giveaway! 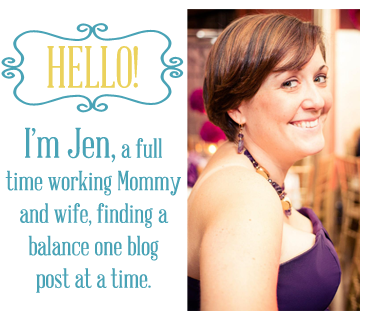 Daycare Transitions & Oliver's Labels Review and Giveaway! Say hello to the March celebration giveaway #2! This review comes at the perfect time. This past Friday, daycare informed us that Ginny would be moving up to the toddler room a few weeks early to make room for some incoming babies. But, but, but.....she's STILL A BABY! No, she's really not, she's almost a toddler. I cannot believe a year has gone by so fast. On top of that, I thought I'd have a few more weeks to prepare for this transition, but it looks like I've got a few days to figure it all out instead. In the infant room, Ginny needed the standard bottles, bibs, crib sheet, etc. Most of it didn't need to be labeled because the babies didn't leave the infant room. In the toddler room, however, they have a cubby in the hallway, a lunch box in the lunch room fridge, and a cubby in the diaper changing room. This means a change of plans. When we first sent Charlie to daycare and needed labels, I found Oliver's Labels through a Google search. There are a lot of label companies out there right now from super simple to Etsy expensive. 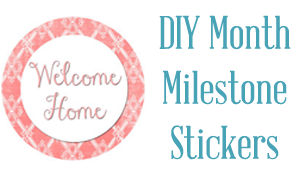 I found Oliver's Labels to be easy to personalize, fun, and inexpensive; I was able to buy what I needed without being cornered into huge packages of unneeded things. With Ginny's daycare transition looming on the horizon, I contacted Oliver's Labels to see if they wanted to partner for a review and they were excited to join in! 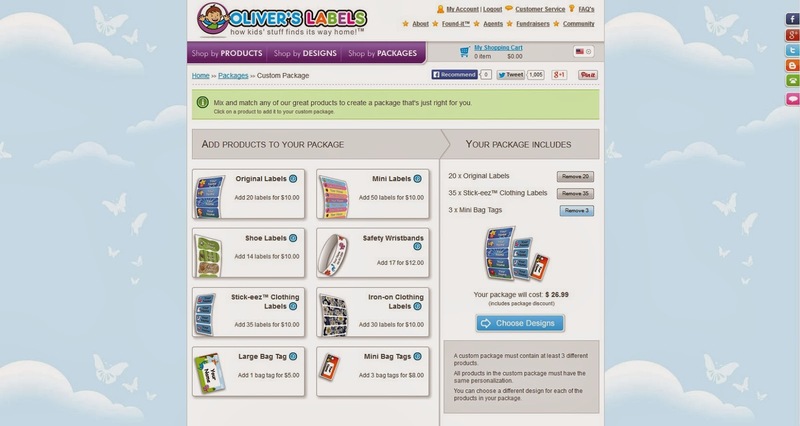 Inspired by her nephew, Oliver, and his penchant for losing shoes, sippy cups, and other things while on the go, Oliver's Labels creator, Debbie began making labels to keep track of the wandering items. Using her experience in the printing industry, Debbie sought to create strong, durable labels to keep track of things Oliver could lose. After other families started asking Oliver's mother about the labels, Debbie knew she had something going and thus Oliver's Labels was born! The customizable package allows you to choose as many of these sets as you'd like to make the best package for your needs. Whether its daycare, summer camp, school, or even labeling adult things for work or the gym, they've got you covered. In our packages, I chose Original Labels, Stick-eez Clothing Labels, and Shoe Labels for each kid. 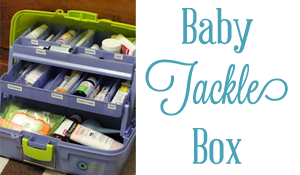 This would be plenty for all of the sippy cups, lunch containers, bedding, shoes, extra clothes, cloth diapers, etc. that they would need at daycare! Customizing the labels was the most fun part. 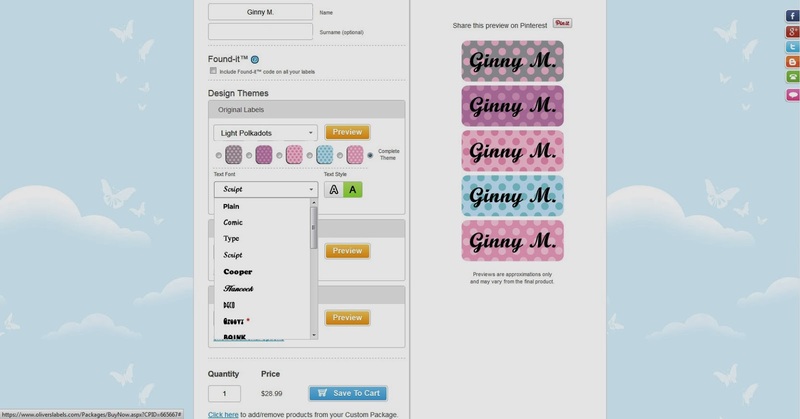 You can make each part of the package a different print with different fonts and colors. Its as easy as pull down menus and checking out the preview. The labels print exactly as you see them on your screen. The themes vary from bright kid prints to more subtle adult prints. There are even special allergy notification labels available. I knew I liked these labels before, but now I seriously love them. I spent Saturday afternoon rearranging all of our daycare gear; giving Ginny all of Charlie's smaller lunch containers and setting up larger ones for him. His little lunch containers have been run through the dishwasher hundreds of times and the labels survived the abuse. We never lost a single label. When it was time to take off his labels and put on Ginny's, however, the labels that have been on Charlie's containers for TWO YEARS came off without a single issue. 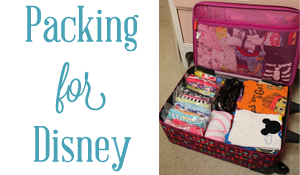 This is especially awesome if, like me, you're into consigning kid stuff. The labels come off (except iron ons, which are permanent) without an issue. They come out of shoes, off clothing tags, and off plastic wear. Ginny got all of Charlie's old ones and he got new Take and Toss lunch containers with new Eric Carle themed labels! He's going to love them. Labels went on everything and even though Mommy may not be ready for the toddler room, at least Ginny is ready. There will be no losing her belongings in the mix! I love knowing that once I put them on, they're not coming off until I take them off - even through dishwashing, laundering, and sweaty kid feet. Ick...especially sweaty kid feet. Would you like to try these awesome labels? 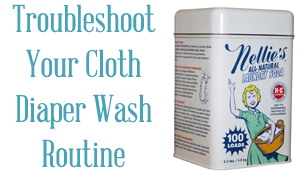 Oliver's Labels was generous enough to offer up a $40 gift certificate to their site to one of my lucky readers! Let the March celebration continue! Oh my goodness, I think I'll be labeling my kids things until they go to college!! Haha Its amazing how fast things can get lost. For older kids who bring their stuff more places than just daycare, there is actually a really cool (and free!) feature called "Found It" that prints a code on the label. That code directs the "finder" to Oliver's Label's website and lets them contact you without putting your actual information on the label. GENIUS! The lunch containers! Oh the lunch containers! Those things go missing CONSTANTLY! Socks and shoes...and pants when he takes them off and throws them. Eli loses his socks and toy cars ALL THE TIME! Leland actually hasn't started school yet but he will in the fall so I am curious what he will lose most then. Sippy cups!! They get mixed up with the other kids cups at daycare all the time! These look awesome! Noah loses miscellaneous clothes all the time! Seems like something gets left behind everywhere we go! I was just thinking yesterday that I need to check into some of these...I know there are several options...thanks for your endorsement of these!! !